The CareGiver Partnership: Did Mom Forget To Eat Again? A question no caregiver ever wants to ask himself or herself is any variation of, “Did mom forget to eat again?” Unfortunately this is an all too common problem amongst seniors. There are many social, economic, and psychological factors that contribute to seniors not eating properly, and over six million seniors in the US are malnourished or at risk for being malnourished. Causes leading to malnutrition... Others do not have the economic ability to purchase healthy foods, or do not know where to begin. Some have diet restrictions that make food unappealing or make preparing foods difficult as they are unsure how to adjust recipes to fit the restrictions placed on their diets by medical professionals. Sometimes seniors are simply not interested in eating because medications they are on are suppressing their appetite, or the prospect of eating alone is not appealing. There are many other reasons seniors all too often go without, or eat too little, or the wrong foods. Many seniors find themselves in a position of getting by on a terrible diet, or eating things like pizza, frozen foods, and Chinese take out. Malnutrition is a serious concern for seniors, and left undetected and untreated can lead to serious health consequences. Seniors who are not getting a proper diet are at increased risk for infections, have difficulty or delayed wound healing, often bruise easily, may be victim to impaired respiratory function, and suffer other physical and mental ailments such as muscle weakness, fatigue, and depression. Encourage exercise. This can stimulate appetite, help them be healthier, and get them moving. Consider outside help. The fact is that many caregivers are juggling care with full time jobs, families of their own, and other responsibilities. Finding a solution for their senior loved one that involves outside help can be a win-win. Assisted care, an in-home assistant, or something to that effect is a good option, but often very costly, and not something an independent senior wants. Mix or Match. Over 60 different choices. Instead, consider Mom’s Meals. This is a service that offers freshly prepared meals, designed specifically for seniors, delivered to their door. This family run company offers six full menus with recipes that meet specific dietary needs, and offer a wide variety of meal choices. There are over 70 items to choose from, and no prescribed menu. 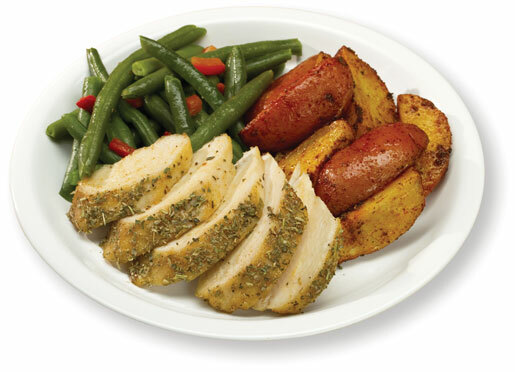 Seniors can select the meals that appeal to them, and for just $5.99 a meal plus shipping, they can have these fresh foods delivered to their door. Then, they just have to pop them in the microwave for three minutes. The meals stay fresh for 18 days in the fridge. This is a great option for seniors and caregivers alike as it is affordable, convenient, tasty, and there is a great variety, insuring the senior will be pleased. Make meal times social. For many seniors mealtime is unappealing because they are eating alone. Thus, they forget to eat, or skip meals, or simply grab something fast, easy, and often not very nutritious. Help them find ways to make meals social. Talk to their doctor about potential contributing factors to their poor eating habits. If your parent is skipping meals, it may be that their medication is decreasing their appetite, their teeth hurt making chewing difficult, or some other solvable medical factor. Try to eliminate these problems to increase their interest in eating.